Today it seems that more and more of our electronic devices require a high speed internet connection than ever. Originally our desktop and laptop computers and then our mobile devices needed to be online and now our TVs, Blu-ray players, Apple TV, PlayStation, Xbox, Wii, etc. are all huge consumers of bandwidth. Wi-Fi is great for browsing the internet on our laptops and mobile devices however it cannot keep up with the heavy demands of streaming high resolution media content. If you happen to have your router in close proximity to these devices or happen to have a home wired with an Ethernet jack you can just plug them in however all too often this not the case. I remember how excited I was when I purchased my Apple TV so I could stream movies from Netflix and other providers directly to my TV. Apple TV comes Wi-Fi ready so I figured all I would have to do was connect to my wireless network and I'd be streaming movies in no time. I was able to connect my Apple TV to my Wi-Fi without any issues and sometimes watching movies would be fine but then other times I would get that annoying lag when your show pauses while your device buffers and catches up. So to fix this I decided to go out and buy a signal booster for my Wi-Fi . I spent the entire weekend trying to get it to work and ended up getting nowhere but extremely frustrated. I even returned the original booster and got another brand to no avail. So I did what I always do when I get stuck and turned to Google for a solution and stumbled across the Actiontec Ethernet to Coax Adapter. The Actiontec Ethernet to Coax Adapter uses your coaxial cable network to create a fast, reliable Ethernet connection. I placed my order and it showed up a few days later on my doorstep from Amazon. And best of all, I had this lovely little device working inside of 5 minutes. I was ecstatic beyond belief! What a relief watching movies without having to deal with buffering delays. 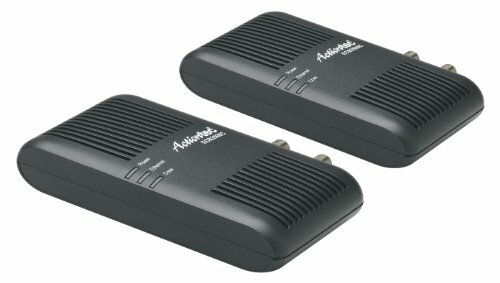 I recently ended up buying a second Actiontec Adapter to provide internet access to a Smart TV I just installed in my basement and it works great too and was just as easy to install. I then decided to hook up my Xbox Kinect so just got an Ethernet hub to provide additional Ethernet connections. This solution is ideal for Verizon FIOS customers because the FIOS router provided by Verizon is built by Actiontec so the Actiontec Adapter can synch with the router directly. If you do not have an Actiontec router, then you will need to buy two devices, one to connect directly to your router and the other to create your new Ethernet connection. Additionally the Actiontec Adapter is hardware encrypted to protect your privacy and you can set up a password for restricted access. So whether you need a direct Ethernet connection for your Apple TV, Blu-ray or for high-speed gaming over the internet take a look at the Actiontec Adapter as your solution.